Nordstrom's Canadian stores will look somewhat different than most of its American locations. The company will adopt a more contemporary look for its store interiors, with windows providing natural light, while most American Nordstrom stores feature a conservative cream-colour aesthetic, void of sunlight. New and recently renovated Nordstrom stores provide insight into the look of its Canadian stores, including a recently overhauled Los Angeles location. Images in this article can be clicked to enlarge, and an annotated slideshow of Canadian Nordstrom stores is provided below. Sources tell us that Nordstrom's extensively renovated location at The Grove in Los Angeles gives insight into the look of Nordstrom's new Canadian stores. Natural light floods portions of the Los Angeles location through a point-supported glass exterior, a first for the company. Its interior, characteristic of new and recently renovated Nordstrom stores, features a clean black-and-white aesthetic. Although tiled ceilings are still present in some departments, smooth ceilings characterize its pricier departments, including designer handbags and its costly womenswear department, Collectors. White marble floors characterize its pricier departments, while high-gloss ceramic tile covers much of the rest of the store. For years, Nordstrom's store design was conservative and formulaic: tiled ceilings with protruding spotlights, cream-coloured floors, wood accented menswear departments, and a generally conservative feel. 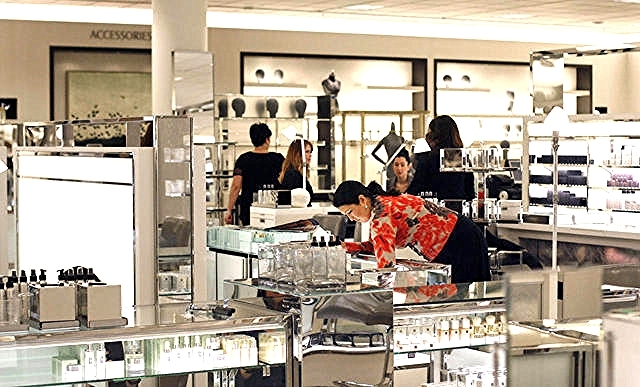 Contrasting sharply is competitor Bloomingdale's, typically featuring a glamorous shiny black-and-while store aesthetic, bright interior lighting and dramatic high ceilings. Interestingly, Bloomingdale's seemingly upscale store interiors lead many to believe that Bloomingdale's stores are more 'exclusive' than Nordstrom, despite the fact that Nordstrom stores generally carry more luxury labels than most Bloomingdale's locations. Although some departments at Nordstrom's Canadian stores will feature smooth ceilings and marble floors, sources tell us that Canada's Nordstrom stores will still have tile ceilings in several of its departments. It will be interesting to see how Canadians react to Nordstrom's Canadian store interiors, as competition from Holt Renfrew and Saks Fifth Avenue will be fierce.